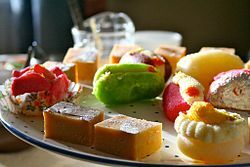 Indian confectionery desserts (known as mithai, or sweets in some parts of India). Sugar and desserts have a long history in India: by about 500 BCE, people in India had developed the technology to produce sugar crystals. In the local language, these crystals were called khanda (खण्ड), which is the source of the word candy. 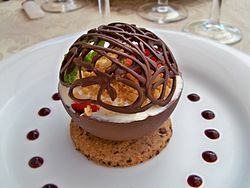 A dessert is typically the sweet course that concludes a meal in the culture of many countries, particularly Western culture. The course usually consists of sweet foods, but may include other items. The word "dessert" originated from the French word desservir "to clear the table" and the negative of the Latin word servire. 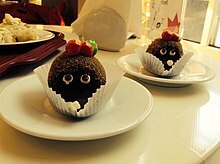 There are a wide variety of desserts in western cultures, including cakes, cookies, biscuits, gelatins, pastries, ice creams, pies, puddings, and candies. Fruit is also commonly found in dessert courses because of its natural sweetness. Many different cultures have their own variations of similar desserts around the world, such as in Russia, where many breakfast foods such as blini, oladyi, and syrniki can be served with honey and jam to make them popular as desserts. Cake is a form of bread or bread-like food. In its modern forms, it is typically a sweet baked dessert. 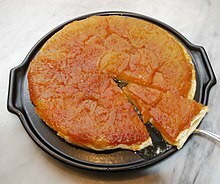 In its oldest forms, cakes were normally fried breads or cheesecakes, and normally had a disk shape. Modern cake, especially layer cakes, normally contain a combination of flour, sugar, eggs, and butter or oil, with some varieties also requiring liquid (typically milk or water) and leavening agents (such as yeast or baking powder). Battenberg cake is a light sponge cake. Madeira cakes tend to have a firm yet light texture, and are traditionally flavored with lemon. Malt loaves are a common snack food in the United Kingdom. Zwetschgenkuchen is a sheet cake or pie made from yeast dough or shortcrust dough that is thinly spread onto a baking sheet and covered with pitted plums. 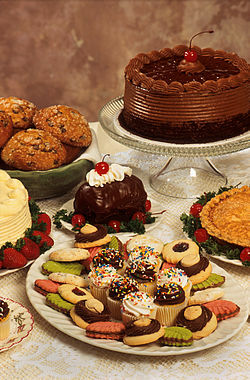 Confectionery is related to the food items that are rich in sugar and often referred to as a confection. Candy is a confection made from a concentrated solution of sugar in water, to which flavorings and colorants may be added. Candies come in numerous colors and varieties and have a long history in popular culture. Custard is a variety of culinary preparations based on a cooked mixture of milk or cream and egg yolk. 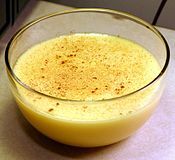 Depending on how much egg or thickener is used, custard may vary in consistency from a thin pouring sauce (crème anglaise) to a thick pastry cream (crème pâtissière) used to fill éclairs. Most common custards are used as desserts or dessert sauces and typically include sugar and vanilla. Custard bases may also be used for quiches and other savory foods. 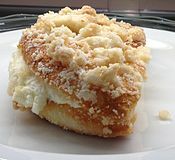 Sometimes flour, corn starch, or gelatin is added as in pastry cream or crème pâtissière. Coconut custard is a dessert dish consisting of a coconut custard steam-baked in a pumpkin or kabocha. Dessert sauces are used to add flavor and texture to desserts, and tend to be sweet. A doughnut, or donut, is a type of fried dough confectionery or dessert food. 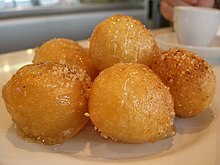 The doughnut is popular in many countries and prepared in various forms as a sweet snack that can be homemade or purchased in bakeries, supermarkets, food stalls, and franchised specialty outlets. Frozen dessert is the generic name for desserts made by freezing liquids, semi-solids, and sometimes even solids. Ice cream is a frozen dessert usually made from dairy products, such as milk and cream and often combined with fruits or other ingredients and flavors. 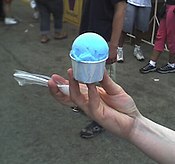 Ice cream became popular throughout the world in the second half of the 20th century after cheap refrigeration became common. 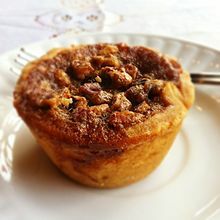 Pastry is the name given to various kinds of baked products made from ingredients such as flour, sugar, milk, butter, shortening, baking powder, and eggs. Small tarts and other sweet baked products are called "pastries." A tart is a baked dish consisting of a filling over a pastry base with an open top not covered with pastry. The pastry is usually shortcrust pastry; the filling may be sweet or savory, though modern tarts are usually fruit-based, sometimes with custard. Pudding is usually a dessert, but it can also be a savory dish. In the United Kingdom and most Commonwealth countries, pudding can be used to describe both sweet and savory dishes. However, unless qualified, the term in everyday usage typically denotes a dessert. In the United States and Canada, pudding characteristically denotes a sweet milk-based dessert similar in consistency to egg-based custards, instant custards or a mousse. Put chai ko is a popular snack in Hong Kong. 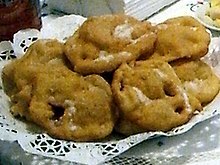 Chomchom, traditional Bengali sweet originated from Porabari, Tangail, Bangladesh. Hakuto jelly is a seasonal Japanese dessert available in the summer. Latin America is a highly diverse area with cuisines that vary from nation to nation. 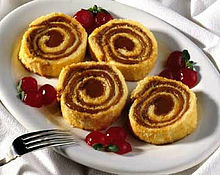 Desserts in Latin American cuisine include dulce de leche, alfajor, rice pudding, tres leches cake, teja and flan. In Southern Africa, desserts may simply be fruit, but there are some western style puddings, such as the Angolan cocada amarela, which was inspired by Portuguese cuisine. ^ "Dessert". Merriam-Webster. Merriam-Webster Incorporated. Retrieved 15 October 2012. ^ "Pastry". Encyclopædia Britannica. Retrieved 3 January 2014. Khatau, Asha (2005). 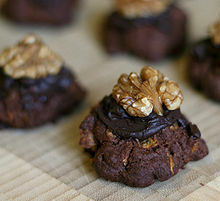 Epicure's Delectable Desserts of the World. Popular Prakashan. ISBN 8179912280. This page was last edited on 17 April 2019, at 12:14 (UTC).